I love food. Unfortunately, some food makes me sick. 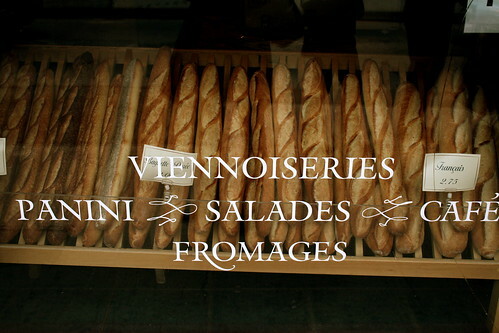 I often think in frustration, usually while eyeing a fresh baguette, about the food system and what brought this on. As a kid, we brought peanut butter and jelly sandwiches to our school and I can't think of any kid having a peanut allergy, let alone a dairy or a wheat allergy. But over time, food has changed. In 1994, the dairy industry changed. They injected a new genetically engineered protein to make cows produce more milk in the US. It made cows sick, and cancer rates shot up. Scientists then engineered soybeans to stand increasing doses of weed killer, and corn was then engineered to release its own insecticide. In the US there are no laws regulating the sale or labelling products with potentially dangerous ingredients. Meanwhile they have hardwired crops so that they can be sprayed and saturated with a chemical for which there are no studies of its impact on developing embryos on the world level. In the US, Obama has broken his promise to label GMO foods. Agribusiness giant Monsanto Co. donated more than $4.2 million against Prop. 37, a California ballot measure that would require labels letting consumers know if foods are genetically modified. Obama has also appointed Michael Taylor, Monsanto's Vice President and chief lobbyist, as senior advisor to the commissioner of the FDA, and left Monsanto to end Africa's hunger. GMOs are a great business plan. It is cheaper and easier to yields large crops, you can patent your seed and afford marketing in your favour. But what about our health? What are the various health problems caused by this food going to do to our economy in the long run? Even Canada is prepared to announce to the world its proposal to allow traces of unapproved genetically modified organisms in imported foods. At the same time government officials admit they don’t trust all countries “equally” when it comes to how they approve use of the organisms. The explosion of GMO-approved crops around the world went from around 30 in 2009 and is estimated to jump to more than 100 by 2015. A rise in food intolerances have followed. Where will we go all of this? Will Canada soon be in the same food dilemma as the US? The US doesn’t require any special labeling for products containing genetically modified crops. Around 70% of what’s on the grocery store shelves in the U.S. contains GMO’s. How long will it take for my gluten-free products to contain the same genetically modified ingredients that possibly made me, and many others, allergic in the first place? GM crops approved in Canada include: canola, corn, soybean and sugar beet. All ingredients that are overused in our food as it is, so it's time to be weary. A scientific study out of Norway released results from experimental feeding studies carried out over a 10-year period. The studies reveal a connection between genetically engineered crops and obesity, changes in the digestive systems and changes in the major organics, including the liver, kidneys, pancreas and more. As Robyn O'Brien says, it's about progress not perfection - we can all do one thing. I will continue to support local farmers, buy organic, cut down on foods with canola, corn or soybean, and not support the companies who are against Prop.37.